This is my second review of a site I've find helpful in the tedious process that is sustainable materials selection. The first review covered the Building Green Suite, which is to date still my favorite source for this info. Today we look at Ecolect, which is a young upstart that has the potential to be the next big thing, but still has a little growing to do before I become truly addicted. My favorite part about Ecolect is that it will often give you hard numbers about things like recycled content or renewable content right on the site, instead of having to fish through the manufacturers' pages to get what you need. If they're willing to report it, that's enough evidence for me to list on my MRc3-7 templates. If anyone has had an issue with reporting third party figures in these situations, please let us know by posting a comment below. I really like the interface as well. Though you can't search by MasterFormat divisions, their search bar does a pretty good job of actually returning materials you're searching for. The simple button interface provides large enough pictures to see the material without having to click and move further along. The materials listed on the site are heavily weighted towards finish surfaces, paints, and textiles. This site seems oriented mainly towards interior designers, which could be a good or bad thing depending on your perspective. Many of the products aren't building materials at all, though the site makes no claim to limit themselves to architectural products in the first place. Anyone working on a LEED for Commercial Interiors project will likely find Ecolect very helpful, but those working on LEED Core and Shell buildings may want to spend their time elsewhere. By my count a few minutes ago there were 470 materials, and I would estimate that about two-thirds of those are variations on single product types (multiple sheens/colors of low VOC paint, different colors of cork flooring, etc). Again, if you're an interior designer searching for the perfect wall covering this is a bonus, as every option is in front of you. On the other hand, there's really not a whole lot of diversity in product types. Have a site you'd like to recommend? Please share your experiences with a comment! Nice post. 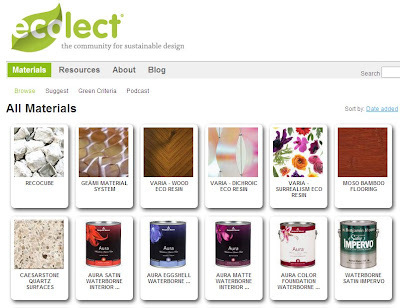 I never would have known about Ecolect (or it would have taken me a lot longer to find it) without your post. I enjoyed the evaluation. I only know thanks to SallyTV. I can't remember which post it was, but she's all over those guys.